Good for Apartments, Hotels, Condos, Offices, Businesses and any other public place! Great for use on indoor use, or anywhere that power in not readily available. 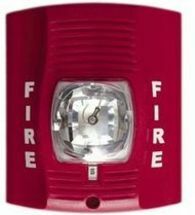 This new Battery Powered Fire Alarm Strobe Light Self-Powered Spy Camera offers outstanding covert security recording in a completely self contained package. Hi-Resolution video images are recorded on a small SD card whenever motion is detected. Rechargeable batteries operate unit (Armed mode) up to 1 month on a single charge. The Spy cameras (Digital Video Recorder) is completely self-contained, totally secure, and easy to use. After the PIR detect the human thermal and cut on the power for the camera. High quality 640x480 color video recording will begin when the instant motion is detected and will continue until there is 10 seconds of no motion. When you are ready to review your video images, simply remove the "postage stamp size" SD card from it's hidden compartment. To playback images, just insert the SD card into your computer or laptop card reader. Click on the SD icon and view a complete list of images, including time and date stamps for each recording. "Click" on any image and the video stream will play from that point on. Easy install, Any one can install within 10 minutes.